Tested and highly recommended by many FPV enthusiasts, performance is comparable with similar product from most famous brand, yet price is only 1/4 - 1/5, great value for the price. 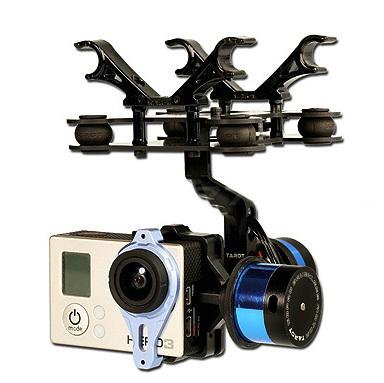 Tarot T-2D gimbal is designed for the Gopro Hero3, which is widely used in film, television productions, advertising aerial photography, etc. Using 6061T6 aluminum alloy full CNC precision machining and brushless motor driving, its overall framework is designed with the idea of compact, easy installation, high precision, lightweight, high stability and many other characteristics. Even if the aircraft is in high-speed flight, it can still stabilize and control the Gopro camera precisely with the highest stability, so pictures or videos output can reach the best quality. 1. Support GOPRO Hero3 video output. 2. Support reverse power supply protection and power voltage compensation. 3. Support motor connector short circuit protection. 4. Support tilt initial angle setting. 5. Support adjustable gains and 3D attitude display on PC software. 6. Support stick rate mode and position mode. 7. Supported receiver type: conventional/S-BUS/DSM2/DSMJ/DSMX receiver. 13. Sensor technology: 3-axis MEMS gyro and accelerometer. 14. Max angular rate: 2000 º /sec. 19. Control range: -45º~45º(roll), -135 º~90 º(tilt). 20. Attitude arithmetic: BLDC gimbal dedicated brushless motor decoupled EKF algorithm. 21. Aerial photography equipment: GOPRO Hero3. * The Video cable to Gopro shown in the manual is NOT included. 1. Software and instruction manual.